Fried chicken, macaroni and cheese and pecan pie. These used to be a few of my favorite foods and are the staple of a traditional soul food meal. “Soul Food is a term used for an ethnic cuisine, food traditionally prepared and eaten by African Americans of the Southern United States,” (African American Registry). Also called the Southern diet, these rich foods are delicious but may also be to blame for the alarmingly high rates of hypertension (high blood pressure) among African Americans. (Some of the other foods you may find in the Southern diet include offal and processed meats, bread, sweetened beverages and a variety of fried foods). “The prevalence of high blood pressure (HBP or hypertension) in African-Americans is among the highest in the world. More than 40 percent of non-Hispanic African-American men and women have high blood pressure. For African-Americans, high blood pressure usually develops earlier in life and is usually more severe,” reports the American Heart Association. Perhaps what’s even more disturbing is that the American Heart Association also reports that around 75 percent of black men and women develop high blood pressure by age 55, compared to 55 percent of white men and 40 percent of white women of the same age. And now a recent study conducted by researchers from the University of Alabama at Birmingham suggested that African Americans were more likely to adhere to the Southern diet, compared to white Americans. And this could be why African Americans have significantly higher rates (compared to whites) of hypertension and heart disease. During a nearly ten year period, the researchers looked at data of 6,897 adults, men and women (older than 45), spanning the U.S. Results showed that 46 percent of black participants and 33 percent of white participants developed hypertension. 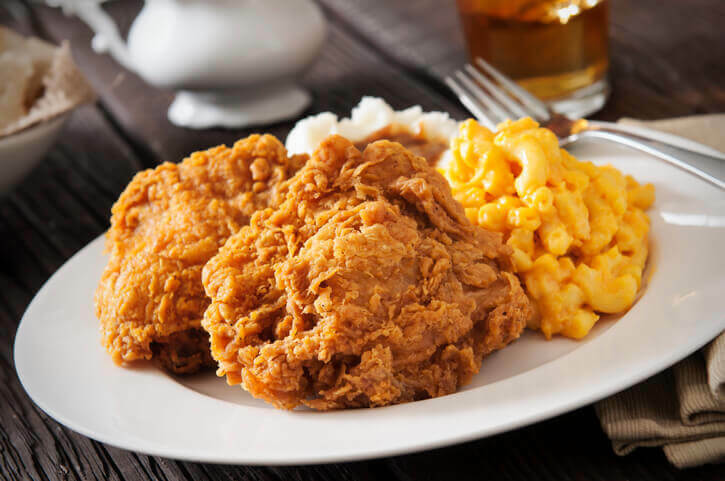 Researchers believe the Southern diet explained why there was a significantly increased risk of high blood pressure in black men and black women. They discovered that following the Southern diet was a stronger connection to hypertension than any other variables like education level, income, BMI [body mass index], waist circumference, exercise levels, stress, depression and the ratio of sodium to potassium in one’s diet. (Sodium and potassium are essential minerals that we need a balance of in order to keep our hearts healthy and help prevent hypertension). “The combination of a high sodium diet with excess calories from fat and sugar and limited beneficial foods containing antioxidants, vitamins and minerals probably creates the perfect storm to make this diet less healthy," one of the lead researchers said. Although being overweight or obese definitely plays a role in increasing one’s chance of developing hypertension, “[i]t is interesting that diet more than being overweight was the biggest contributor to the racial disparity in hypertension. This suggests we consider interventions to increase healthy foods in the diet while minimizing fried foods and processed meats." So here again we see how important it is for us to fuel our bodies with antioxidant-rich, nutrient-dense foods, like fruits, vegetables, whole grains and legumes, in order to maintain our health and ward off disease. These foods contain blood-pressure lowering nutrients such as calcium, potassium, magnesium, vitamin C and more. Some delicious and healthy foods that may aid in lowering blood pressure include spinach, pink grapefruit, cherries, carrots, apples, apricots, bell peppers and mangoes. And the issue of hypertension is not only an African American issue. The American Heart Association estimates 103 million Americans have high blood pressure, which is half of all adults in the United States! A major reason for this is that many people have a diet high in unhealthy fats, sugar and processed foods. The good news is that you have the ability to change your diet if you want to. Eat healthily, educate yourself about these 7 nutrients that may help lower your blood pressure, take an at-home blood pressure test so that you know where you stand and consider taking routine nutrient tests to ensure you have the right balance of nutrients, like magnesium and potassium. These are examples of nutrients which directly affect your ability to maintain a healthy blood pressure. Finally, talk with your doctor or a competent healthcare professional about what foods you should include in your diet, especially if you already have high blood pressure or any other metabolic issues. If your nutrient test determines you have nutrient imbalances, a competent healthcare professional will help you with changing your diet as well as possibly recommend quality supplements you can take.